Granola! What a fabulously tasty food. 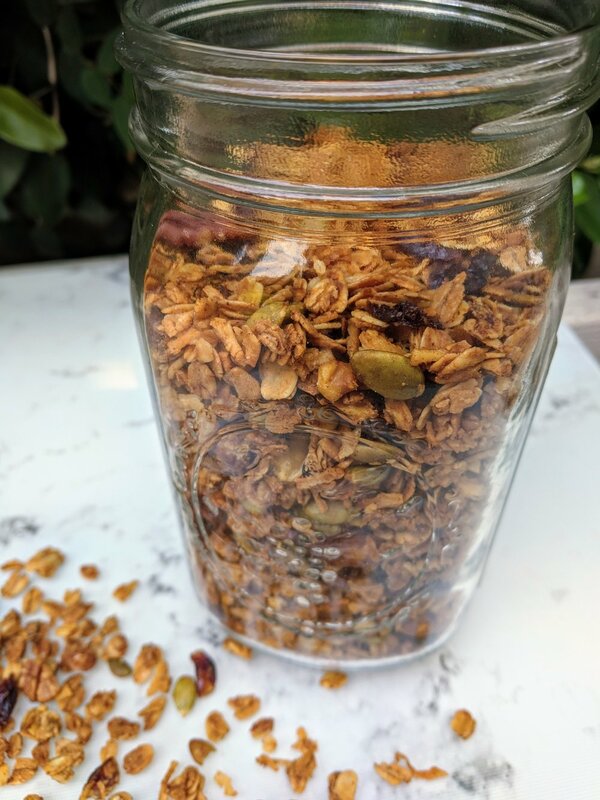 You can definitely buy granola at the store, but the tastiest ones usually happen to be pretty expensive, and their added sugar content varies. 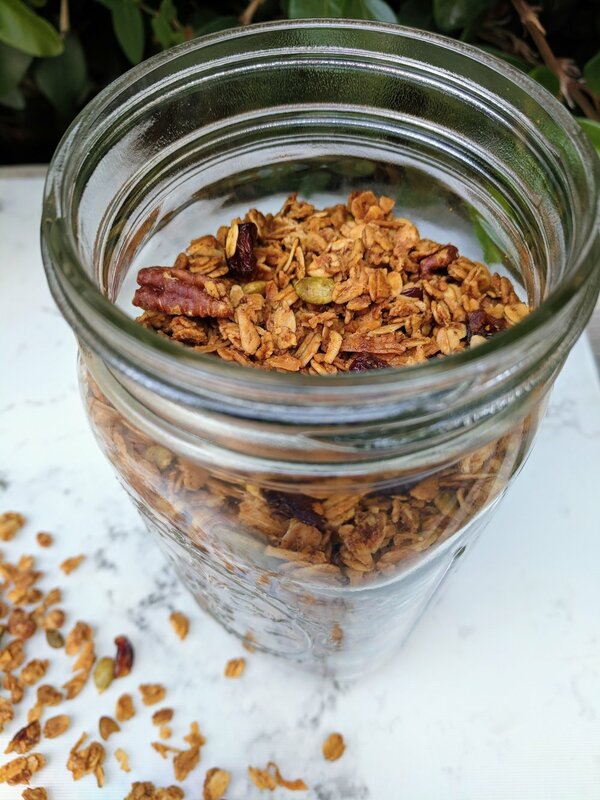 Making your own granola sounds daunting, but it can actually be pretty easy, and getting creative with it can be lots of fun. I am much more of a yogurt or kefir + granola person than a cereal + milk person, but you can actually also use this granola as a cereal too. It's got a boost of carbs + fiber, a good amount of protein and Omega-3 fats, delish flavors, and a mad crunch. The secret to the crunch?? EGGS, which make this recipe decidedly #notvegan, but actually add some extra protein, B vitamins, choline, fat, and the fat-soluble vitamins A, D, E, and K.
As you continue to read this blog, you’ll realize that I REALLY love eggs; they’re so versatile and nutritious! Pasture-raised hens have more of the micronutrients needed in pregnancy, so they might be worth the few extra bucks. Conventional eggs are still awesome! The fiber from oats, nuts, seeds, dried fruit, and whole-milled flaxseed can help good gut bacteria flourish (especially if you eat this with some probiotic-rich kefir or yogurt! ), aids in constipation, and actually also helps with milk production during lactation. The nuts and seeds provide additional magnesium and selenium, which are both really important in pregnancy. The whole-milled flax provides a boost of ALA fat, get yourself some and use code 25Manitoba to get 25% off your order! Moral of the story: this is a great breakfast or snack, and as you’ll see below it is pretty dang easy to make. If you have gestational diabetes, see how your blood glucose reacts to a tablespoon of this sprinkled on top of Greek yogurt when eaten for breakfast; if it doesn’t go well, simply save it for a snack later in the day! Make it your own by choosing your favorite trail mix or nut/seed/dried fruit (and even chocolate) combo; there’s lots of mixes to choose from and Trader Joe's has some of my personal favorites. The recipe below is what worked the best in recipe testing round 2 with the 'Oh My! Omega Trek Mix' (cranberries, almonds, walnuts, pumpkin seeds, pecans and pistachios). Grease a cookie sheet and preheat oven to 275 F.
In a large pot over very low heat, whisk together brown sugar, honey, oil, eggs, salt (if desired), vanilla, and cinnamon. If egg begins to cook, turn off the burner, you just want a bit of warmth to adequately mix these ingredients. Add oats, mix well to coat with the sugar mixture. Mix in coconut and milled flaxseed, then mix in trail mix. Spread the mixture evenly on the greased cookie sheet. Bake for about 1 hour total. Every 20-30 minutes, take granola out to stir. It will be done when it is golden brown.